"Thanks for the ride Beau" I said as I stepped out of the car with Luke. "No problem" He replied. I closed the door and he started the car. He pulled out and Luke and I waved. 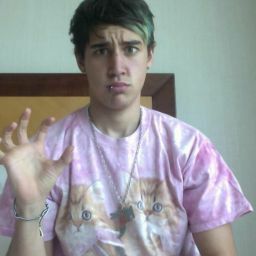 When Beau was out of sight Luke grabbed my hand, startling me. "So, you gunna lead the way?" He asked. I pulled him along, through the lobby, to the elevator and into my apartment. "Wow, this is such a nice place! I wouldn&apos;t mind living here!" Luke said as he looked around I awe. "You could if you want, I&apos;ve got loads of room" I offered, I figured it would be nice to have a room mate. "Yeah, for sure, free of charge too! You can move in whenever" I said with a huge smile plastered on my face. I grabbed his arm and pulled him to the extra bedroom. He looked around then jumped onto the bed. "Lu-Luke, you&apos;re... squishing...me" I managed to get out through laughs. He put his hands on each side of the bed near my shoulders. He was now hovering over me. We were both looking each other in the eyes. He started to lean and so did I. Was I really going to kiss Luke? I can&apos;t believe this is happening! Our lips collided and I felt instant sparks, our lip moved in sync and I had butterflies in my stomach! Luke licked my bottom lip, asking for entry which, I gladly gave to him. This was one of the best kisses I have ever had in my life. He was passionate and I loved every second of it. We both pulled away, gasping for air. Once we caught our breath we both just sort of looked at each other and giggled, taking in what just happened. After a couple of minutes Luke was still hovering over me, he looked like he was going to say something but before he could I spoke up. "Umm... Luke, I have to go get ready so we can go shopping." He frowned a bit and got off of me. I sat up and straightened myself out. "Luke is the best guy ever, I love him so much!! <3 X." Luke had also retweeted it. I laughed at all the replies it got and followed some people who said they were &apos;dying for a follow&apos; which is weird because I usually don&apos;t get messages like this. I was on twitter for hours until I decided I should get some rest since I&apos;ll be helping Luke move in the morning. I grabbed my phone and headed to bed. Hey guys! I was wondering if you were liking the story? Should I continue it? If you have any ideas to improve it or anything that should happen in the story, you could always leave a comment and tell me. If you think I should continue you it, could you please vote for it or comment.